Edward T.R. Applegate (June 1, 1831 – February 22, 1915) was born in Milford (now Etra). He worked on the family farm until age 20, at which time he became a peach and livestock merchant with his father-in-law, Benjamin Reed. The company, Benjamin Reed & Sons, owned large peach orchards and supplied the New York and and Philadelphia markets. After he resigned from the company he went into the lumber business, first with Sindey C. Denise and later with Enoch Dey (under the business name Applegate & Dey). He also spent time as a cranberry grower. 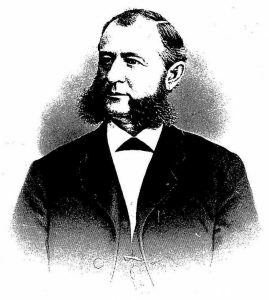 Applegate was one of the original stockholders and directors of the First National Bank of Hightstown, and assisted it with its consolidation with the Central Bank of New Jersey. He was also a former director of the Pennsylvania, Slatington and New England Railroad, and of the Hightstown-Perrineville Turnpike Company. He was instrumental in obtaining the charter for the latter from the New Jersey Legislature in 1859. He served in the New Jersey Assembly in 1859 and 1860, and was one of the eight founders of the Peddie School. Applegate was a member of the school’s first board of trustees and acted as its treasurer for several years. In 1877 he was appointed judge of Mercer County Court of Common Pleas, a position he held for ten years.